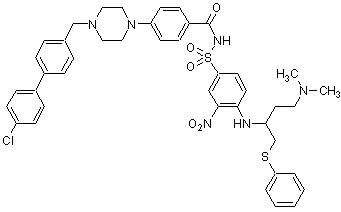 BH3 mimetic Bcl-xL, Bcl-2 and Bcl-w inhibitor. Triggers Bax/Bak-mediated apoptosis (EC50 values are 79, 30 and 198 nM for Bcl-xL, Bcl-2 and Bcl-w mediated apoptosis respectively). Shows antitumor effects in vivo. Functional Studies - ABT-737, BH3 mimetic Bcl-xL, Bcl-2 and Bcl-w inhibitor (ab141336)Gu et al PLoS One. 2014 Sep 2;9(9):e103015. doi: 10.1371/journal.pone.0103015. eCollection 2014. Fig 5. MI-63 acts synergistically with ABT-737. Panel A. 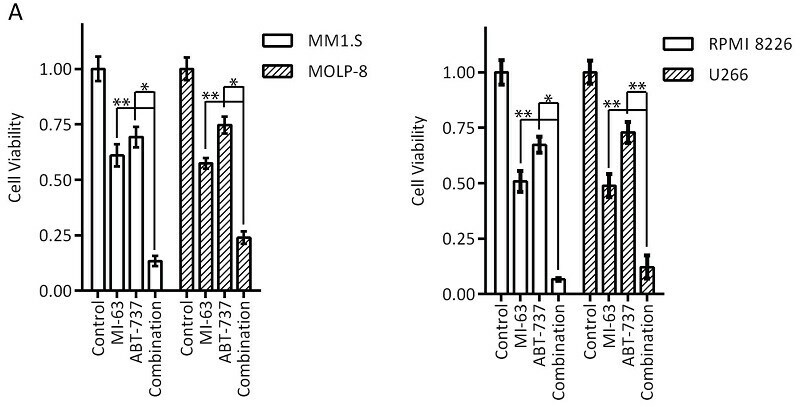 The combination of MI-63 and ABT-737 was studied in wild-type p53 MM1.S and MOLP-8 cells (left panel), and in mutant RPMI 8226 and U266 cells (right panel). Multiple doses of each drug were used for this experiment, with one representative condition shown. *p<0.005, ** p<0.05. Publishing research using ab141336? Please let us know so that we can cite the reference in this datasheet. There are currently no Customer reviews or Questions for ab141336.